"Rambo" is a sound, typey, brindle son of our Buddie. He was bred by Thelma & John Hunt. 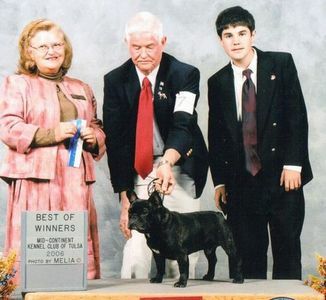 Rambo wins WD/BOW at the Wichita Kennel Club Show Fall 2006! Copyright © 2006 House Of Tucks French Bulldogs, Doherty Kennels & JLS Canine Services Web Design.